I’m not one to brag about my culinary endeavors, but this time I feel compelled to. This soup was one of the best dishes I’ve ever made, and hands-down, the best I’ve made in the past year. I was shocked that a combination of such simple ingredients would result in something so delicious. It was really easy to make, too. In all seriousness, by reviewing a few types of soup recipes, coupled with my love of Asian food and coconut milk, I figured that taking the best ingredients from several recipes would be a winning combination. After plenty of other culinary disasters, this time I figured right. The result was a surprisingly flavorful, yet mild, soup from which no particular ingredient stood out. I do think, though, that the curry paste I used played a strong part in how the flavors melded. 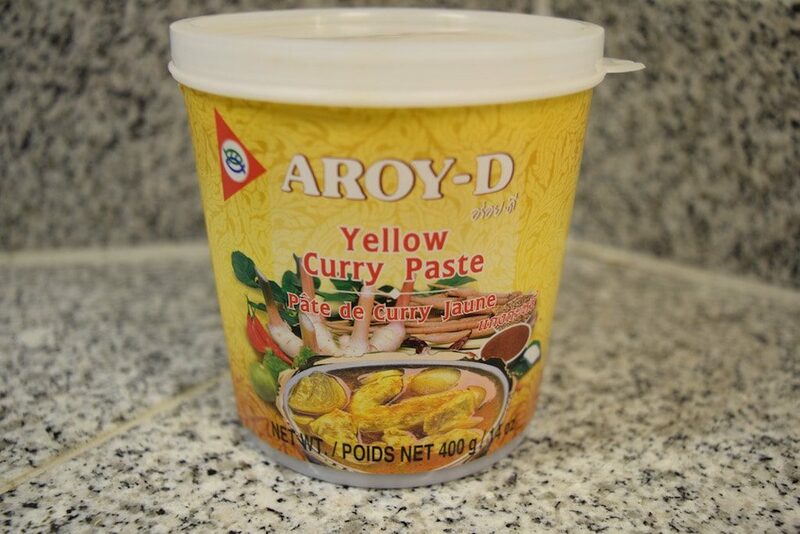 I’ve never used yellow curry paste before, and it’s quite mild compared to the red and green varieties. 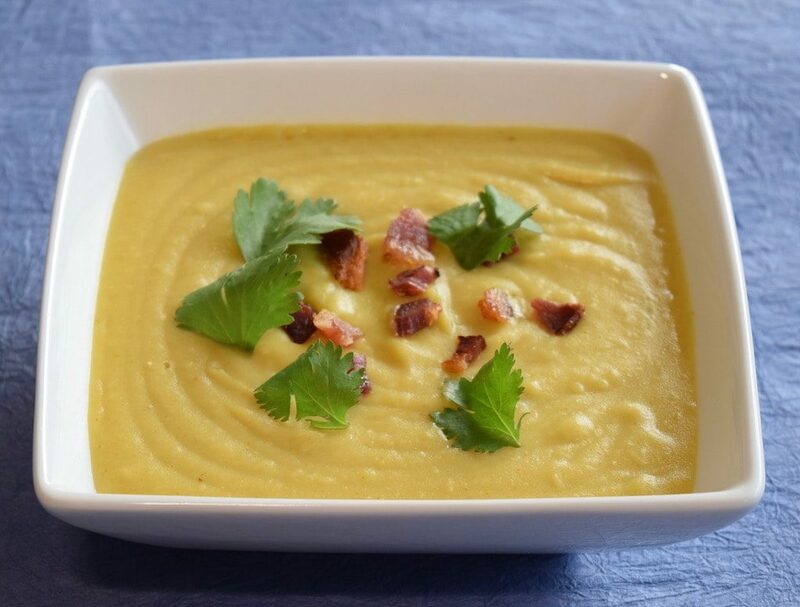 Leave out the bacon, and you’ve got a vegetarian soup. Use a fish-sauce substitute and you’ve got a vegan soup. This is the brand of curry paste in the recipe. It’s just a basic, mid-grade product. 4 cups of low-sodium vegetable or chicken broth (any low-sodium broth would work). In a pot or sauce pan large enough to hold at least 5 cups of liquid (with room to spare), lightly brown the shallots in the oil over medium heat. Add the minced garlic after the shallots are done. Add the diced potatoes, followed by the broth, fish sauce and curry paste. Bring to a low boil, then loosely cover and cook at a medium simmer until the potatoes are soft and fully cooked through. Remove from heat and puree until smooth. I used an immersion blender right in the cooking pot, but it did take a bit of work to get all the potatoes pureed. Some pieces can be elusive. Maybe a blender would be more convenient. 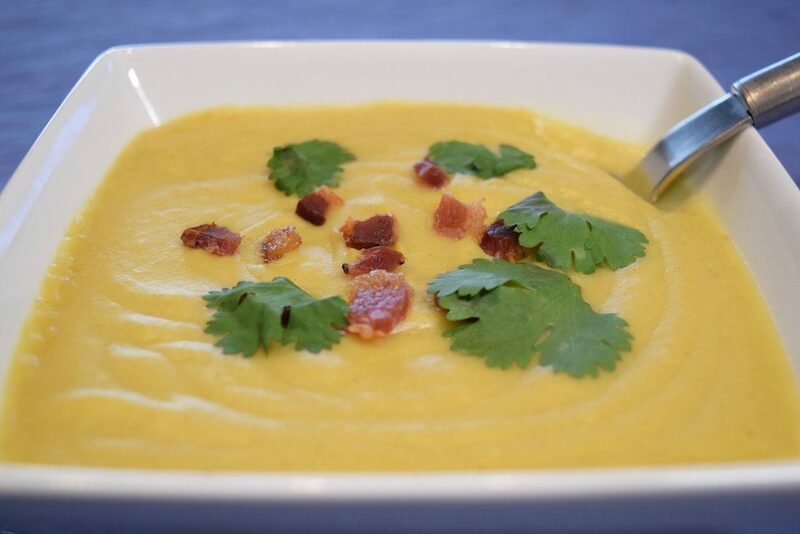 Once pureed, return the soup to low heat and have a taste. If you want more curry flavor, now’s the time to add more paste, because next comes the coconut milk. Stir in the coconut milk, but do not let the soup boil, lest the coconut milk will curdle. At this point, the soup should be very thick and silky. If you want it more fluid, gradually add more coconut milk to the desired consistency. When done, serve warm in bowls and top with bacon and cilantro to garnish. « Q: What’s The Difference Between a Chickpea and a Garbanzo Bean?